Enormous advances in public health and medicine have taken place in the last 150 years and, while acute, fatal diseases have declined, chronic, long-lasting and disabling conditions have increased – this saves lives and increases society’s care burden. In high-income countries, approximately 30% of patients in intensive care units are affected by at least one hospital-associated infection. In low- and middle-income countries the infection rate is 2-3 times higher. Antibiotic resistance is likely to kill 300m people prematurely by 2050 and, unless substitute methods are found, many surgical procedures, cancer treatments and caesarean births will become risky or impossible, and many infections will become more widespread. Annual death tolls: 500,000 from guns, 1.2m in car accidents, 1m from antibiotic resistance. Pandemic events could cost the world on average $60bn per year through the 21st Century. Over 100m people in India use homoeopathy as their sole source of medicine. A Swiss government report cited that six out of seven controlled studies of homoeopathy’s efficacy in comparison to conventional medicine found it more effective. The future holds both brighter and darker prospects in global healthcare. Bright inasmuch as new advances in care, medicine and health service delivery are promising. The prospect of significantly reducing or, as some claim, even eliminating disease, is within reach this century – at least for some people. Yet an important shake-out is likely to come since we stand at ‘peak health’: we approach a crunch between advancing medical procedures, actual medical outcomes, escalating healthcare-provision complexities and problems with economies’ capacity to support spiralling health costs. On the downside, over-prescription, misprescription and over-medicalisation, antibiotic resistance, medically-related toxicity and opioid addiction, hospital-induced diseases and the risk of pandemics pose significant problems. In USA in 2011 prescription drugs caused 128,000 deaths and 2-4 million serious or debilitating injuries (BMJ) – and this is not unique to USA. Errors do happen, and that’s life in a very demanding health sector, but a large part of this problem lies in an unquestioning faith in the efficacy of synthesised and refined pharmaceuticals and other medical practices, reinforced by the marketing and lobbying power of Big Pharma corporations, and in a tendency to reject traditional medical knowledge and simpler methods in favour of centralised, complex, expensive, profitable, invasive treatments. Symptoms are treated specifically and in isolation without looking at all-round causes and solutions. Medical practices and medicinal side-effects have even become a cause of disease, in some cases reaching epidemic proportions. Additionally, healthcare inequalities make for one healthcare for richer and another for poorer people, with insufficient parallel development of public health coverage and infrastructure. This is partially a result of World Bank and IMF privatisation policies and Big Pharma influence. It is no longer clear whether profit or positive medical outcomes primarily drive the health industry. Humanity is undergoing an historic health transition: improvements in healthcare have turned acute and fatal diseases into longterm chronic ailments. This has reduced one set of problems and introduced new ones. For individuals, life-saving is in most, but not all, cases a blessing. Yet on a larger scale it increases population (which matters a lot in parts of Africa and Asia), raising life-expectancy and dependency levels, increasing family and community healthcare and disability burdens, and variously affecting all societies. This creates a moral and economic dilemma since new medical advances tend to fuel further demand for care, endlessly escalating healthcare and social support expenditure. In rich countries this has posed a significant moral problem, with old people sometimes kept alive longer than is beneficial (arguably), and in poorer countries it can weigh heavily on women in extending their family care duties. The full costs and benefits of healthcare need to be considered more roundly and objectively. Healthcare in USA absorbs 16% of its GDP and, in countries lacking universal health coverage, medically-related debt is burdening and ruining families. In countries with publicly-funded or insurance-based medical systems healthcare costs are consistently climbing. Pressures on pension funds and disability and care systems stretch many nations, and families and communities now carry burdensome care responsibilities where previously death would have occurred. 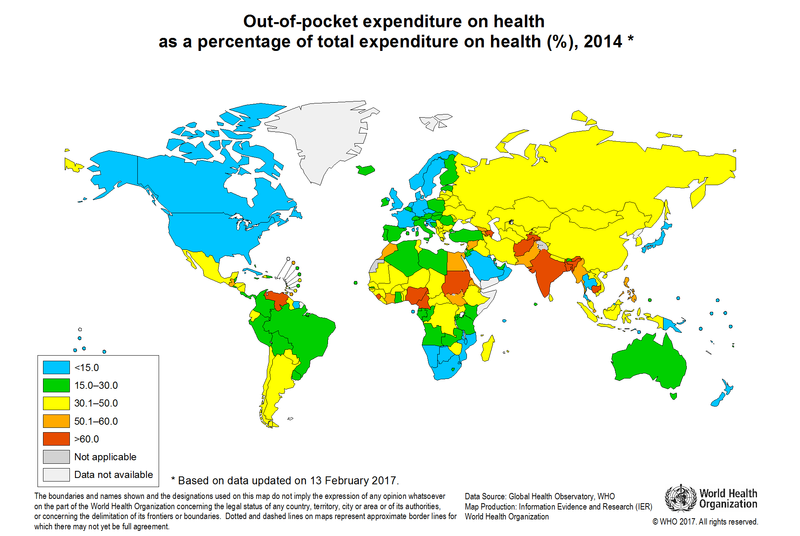 If current trends continue, health expenditure will surpass a probably unsustainable 20% of GDP in richer and middle-income countries. We might have to contemplate introducing new rules such as a ban on lifesaving interventions after the age of 80, or on certain types of operations or medications, and more research needs to be done on the longterm effects of antibiotics, EM-radiation or chlorine and the environmental effects of pharmaceutical pollution. The world is thus heading toward a healthcare-provision crisis that is likely to be decided by economic constraints more than by medical or ethical factors – ethical wisdom has been suspended in favour of an unquestioning growth of ever more sophisticated medical solutions. One partial answer is to reallocate expenditure from treatment to monitoring and preventative medicine – and this is happening, helped by new technologies – but it doesn’t entirely solve the problem. While improvements in dietary and lifestyle issues are much needed, preventative medicine is leading humanity into complex genetic and other practices which, again, will benefit some more than others, introducing new problems with chronic conditions and alterations to the human gene pool. The moral dimension is difficult territory to enter. It can lead to accusations of heartlessness or even genocidal intent. But unquestioning acceptance of and demand for life-saving measures leads to a form of collective denial that is dangerous for the future of humanity. Reducing child and childbirth mortality is of course positive, and many people alive today would otherwise have passed away. But genetically, nature has a way of culling individuals by ‘natural selection’ who, under normal circumstances, would not survive or add to the vibrancy of the human gene pool. When such survivors reproduce, their tendencies can pass to new generations and this leads to an incremental net weakening of the human stock. Following the eugenic experiments of the earlier 20th Century, this subject is taboo to mention, but it nevertheless constitutes a longterm public health issue with enormous consequences. Gene-editing is proposed as a solution, but this too has its dangers, especially when gene-edited individuals reproduce, thus embedding genetic errors into the human gene pool. Establishing guidelines in this area is difficult – who should survive and who should die? – but indiscriminate life-saving is also a form of ‘playing God’. So, by default, we opt instead for an inevitable economic solution to this question: in future we will save lives medically to the extent that we can afford it. The lifestyle-related ailments of today reflect deep issues around what Sigmund Freud called ‘civilisation and its discontents’. Many people eat, drink, smoke and engage in risky and harmful activities (car-driving, desk-sitting, unhealthy diets and lifestyles) that exert a negative influence on public health. In poorer countries, weak healthcare provision and infrastructure, plus population growth, pollution, smoking, overcrowding, poverty and undernourishment are major issues. These challenges, with their psycho-social, economic and environmental background, point to a need to address wider causes, not just symptoms, of disease and injury, while resorting less to (profitable) medicalisation. The largest killers today are heart disease, stroke, respiratory infections, COPD (bronchitis and emphysema), lung cancer, diabetes, dementia, diarrhoeal diseases, TB and motor accidents. All can be reduced by addressing lifestyle, dietary and living conditions, pollution, meaning-of-life and the psycho-emotional condition of society as a whole. New advances are rapidly emerging in genetics, biotechnology, materials sciences, bioinformatics, diagnostics, supportive technologies and robotics, precision medicine, genetic sequencing and genome mapping, biomarker testing and precision-targeted treatments. Regenerative medicine involves stem cell transplants, cell reprogramming and synthetic organs. Networking technologies will also bring professionals and patients closer, allowing consultations, diagnoses, specialist contact and even remote-controlled operations over a distance. These methods are expensive, accessible only to some, and they bring new dangers – such as alteration of the human gene pool, and electromagnetic and pharmaceutical toxicity – coming at a time when the economic capacity to invest in costly, specialist technologies might start declining. So they will be available mostly to those who can afford them. For poorer nations and people they are less available or affordable: this reinforces global inequality, which itself is a key global healthcare issue that ultimately affects everyone, rich and poor. Medical technology needs to move toward enhanced simplicity, economy and decentralisation, but sophisticated systems are profitable, disincentivising a wider, global public health approach close to the ground. Traditional and complementary medicine (T&CM) offer a major key to unlocking this inequality, complexity and ill-health loop. They focus on immunity-building, on subtler, less toxic and less polluting remedies, on diet, skeletal manipulation, self-diagnosis and treatment, lifestyle and psycho-spiritual issues. In some cases T&CM are more effective and economic and, in others, especially in acute and emergency care, extreme cases and surgery, modern medicine is excellent. This points to a need to integrate both. This is happening mainly in India, China and developing countries where traditional therapies go back centuries and economics constrain the import of expensive modern medical technologies and pharmaceuticals. Investment and research in T&CM needs encouraging – and this research needs to be conducted on the operating terms of T&CM, in terms of actual medical outcomes, rather than imposing on it the narrower norms of science-based medical research. Otherwise, irrational and prejudicial results are obtained, such as the rather ideological judgement that homoeopathy cannot work because, in the scientific way of measuring things, it contains no active ingredients – yet this is precisely how it works. Just because the logic of T&CM is fundamentally different from modern medicine, this does not make it invalid. Meanwhile, in richer countries complementary therapies, which after many decades of use are neither officially accepted nor supported, are used by millions of people, especially women, making use of both self-medication and practitioner expertise. Absurd institutional suppression of these therapies shows why the West is losing its former global leadership in many spheres, limited by its own vested and business interests. The initiative in developing integrated medicine thus passes to the developing world, which takes a more pragmatic and cost-benefit approach. And this is one reason why the developing world is overtaking the developed world. Then there is a big elephant in the room. This is a bigger issue than societies of all kinds prefer to acknowledge – or they give lip-service to it without sufficient follow-up. Commonly ascribed in modern medicine to brain chemistry, genetics, hormones, medical conditions, stress, grief and difficult life-circumstances, mental health issues go deeper than this. They reflect social, cultural and psycho-spiritual, not just personalised and medicalised issues. This gets more serious when mental health problems extend to drug- and alcohol abuse, suicide, violence, mass shootings, terrorism and sociopathic behaviour. Mental illness can also be misappropriated, used as a way of projecting responsibility for broader social ills onto unconventional or dissenting individuals, or onto people experiencing difficulties adapting to society as it is, or in racist, sexist or culturally chauvinistic terms. Modern society is taken to be a panacea and the zenith of human evolution, but the cognitive dissonance by which it operates and the way it defines ‘normality’ to mean compliance needs serious examination. Mental health issues are variously stigmatised because they pinpoint unacknowledged society-wide weaknesses and collective psychoses. They are perceived to bring shame on sufferers’ families and communities. Investment in treatment is inadequate in most countries. Therapies and medications do exist but the full range of treatment options, especially psychotherapeutic, holistic and even religious approaches, is under-utilised. Demand for mental health services is expanding globally as a result of growing need and greater mental health awareness. Staff shortages, lack of mental health knowledge amongst general practitioners, over-medicalisation, poor investment and low political prioritisation are common. In the rich world, social isolation is a significant mental health factor. While medical and psychotherapeutic methods of dealing with mental health issues are valid and valuable, something is clearly being missed. The character of modern society itself is a key cause of today’s burgeoning mental health problems. Modern life has been squeezed into a box, and not everyone fits into it. Society’s unhappinesses, contradictions, alienation, toxicity, competitiveness, and endemic poverty of empathy, protection and love are all causes of mental health disorders. Until this is recognised, no amount of medication or counselling will resolve the problem. Mental health issues are thus completely related to all of the other themes covered in this report. We badly need to own up to the fact that we live in a mad world, and this matters a lot. Healthcare inequalities affect us all. People living in poverty or in overcrowded and ill-serviced conditions, or experiencing undernourishment, disaster and conflict, can act as incubators of potential pandemics. To prevent TB, cholera or ebola knocking on our doors, comprehensive global health monitoring and coverage are needed – especially since air travel and migration allow infections to travel fast and increasing drug resistance has rendered key remedies ineffective. Pandemics are an existential risk and medical authorities expect an outbreak anytime, bringing potentially disastrous effects to any society – rich, middling and poor. They can also be caused by biosecurity lapses (escapes of deadly pathogens from laboratories) or through use of biological weapons. The main antidotes are comprehensive public health monitoring and coverage, with rapid response procedures. Improving overall immunity, health and social conditions provides protection, and fast action to contain and manage outbreaks, wherever and whenever they happen, is critical. The European heatwave of 2003 caused 70,000 premature deaths – and this in a rich part of the world. Climate change, affecting air temperatures, water and air quality, food supplies, migration, sanitation and infection risks, is likely to bring increased disease susceptibility and health deterioration, particularly in areas with weak health infrastructure. Floods contaminate water supplies with microbes and chemicals; high temperatures exacerbate ground-level ozone, air pollutants and thus respiratory diseases; high rainfall provides hatching grounds for disease-bearing mosquitoes; and weather extremes and events weaken food production and thus nourishment, health and survival rates. Diarrhoeal diseases currently kill 750,000 children each year, and weather disasters kill 60,000 people annually – these will rise. WHO estimates that climate change will cause 250,000 additional premature deaths per year from 2030 onwards. Even in richer countries, disasters disrupt distribution of medication, overtax hospitals and cause multiple complications. Add to this the growth of big cities and slums, where infection can spread rapidly, plus poor sewage treatment, pharmaceutical pollution, EM-radiation, nutrition-poor refined, packaged foods, plus a cocktail of other factors, and the world faces serious health challenges. Universal healthcare, with added efforts to address pollution, lifestyle issues and social support systems, is an increasing necessity. WHO, the Red Cross, MSF and other NGOs try to address these issues, and governments, business, media and the public need to get behind the improvement of public health infrastructure, internationally. Our own and everyone else’s health are tied together, globally. Today we are both more knowledgeable and more neurotic about health and fearful of death than ever before. The rich world is over-medicalised and commonly overweight, while the poorer world lacks health facilities and harbours undernourishment problems – this is a matter of human rights and human wrongs, in both worlds. Humanity needs to face awkward questions about what is viable, sensible and proportionate in health and medicine, looked at as a whole. This involves facing hard-to-sell social and political challenges, but failing to address them will nevertheless bring them up by force of circumstance, through the agency of crises and declining health and survival trends. The future is bright because we have a range of modern, traditional and complementary medicines available, and tremendous scientific and technological changes are taking place. The future is dark because risks and stress-points are going critical, together with various other longterm issues – demographic, environmental, economic and social – that affect health and disease. A key problem worldwide is the marketisation of public health systems and the distortions that arise from profit-generation in the medical industry – distortions that breach the spirit and the letter of the Hippocratic Oath. Big Pharma has become an enormous and profitable industry, its own priorities having increasingly determined public health policy and decisions to an extent that genuine public benefit has now arguably taken second place. Meanwhile, for individuals, one fundamental psycho-social issue underlies this whole question: in the end, the opportunity to live a full, meaningful life can help us become less obsessed with living a long life at all costs. The weakness of moral and medical restraint in prolonging life, most benefiting those who are financially, medically and geographically advantaged, constitutes an overconsumption of resources at a time when attention to comprehensive universal healthcare, especially for the younger population and the underprivileged, is crucial for everyone’s wellbeing and survival.